Collegiate disability sports have been around for a while. Currently, students with disabilities can play and even receive scholarships for track, field, wheelchair basketball, wheelchair tennis, and swimming at several universities around the country. But this is the first university to recognize a sport just for individuals with vision loss. Portland State University, where Jen Armbruster works, is following suit to Berkeley’s foundation. They are currently functioning as a community team but with university students on the team and plans to be able to offset cost for the students this upcoming season they hope to have a PSU team by next season. Armbruster brings up another good point about team sports. Team sports have been shown to have great effects with students. In an article on Athletics for All written by Regina Whitmer Chris Bigelow, director of student services for the Northshore School District in Bothell, Washington says that, “team sports helps youngsters learn about teamwork, collaboration, and solving problems, all important 21st-century skills”. Kids with visual impairments often have no opportunities for team sports and this move could be instrumental in getting them off the sidelines and into the game. As an individual without a disability growing up it was my dream to get a college scholarship to play ball. I worked hard and was fortunate enough to see my dream become a reality. But I can’t imagine what my high school years would have looked like if I knew I didn’t have a chance. Not because of my own personal skill or dedication but because the opportunity didn’t even exist. To me that is a tragedy and one that doesn’t have to exist! Imagine the cycle of effect this one little shift could have on an individual’s life. Now the high school student with a visual impairment works hard on and off the court so that they have the skills and the grades they need to get a college scholarship to play goal ball. That scholarship leads them to a secondary education that plays a vital role in helping them get a job. And that job leads them to be a successful, independent, contributing member of our society! So I say let them play ball! More colleges and universities need to step up and follow suit, and I wonder which school will be next? Kelly Bonner ( MA EP, ACSM-CIFT) is an Information Specialist for NCHPAD as well as a FItness Specialist at Lakeshore Foundation where she has worked for the last 10 years. Originally from Miami Fl. she came to Alabama to play ball and get her undergraduate degree in Fitness and Health Promotion from Samford University. She started working at Lakeshore Foundation in 2000 and never left. A few years later she obtained her master’s degree at the University of Alabama at Birmingham in Exercise Physiology with an emphasis in adapted sports. While working at Lakeshore she has helped with numerous activities ranging from adapted water skiing, rock climbing, aquatic classes, land based classes, youth programs and coaching the youth track and field team but her first love has always been designing adapted exercise prescriptions for individuals with a disability. When she is not at work you can probably find her out running, biking, working in her yard or at her church. This is the best news of the sports year! To know that a new athletic opportunity for people with disabilities has been established is just another positive step toward making our nation even more aware of the health benefits for people with disabilities. Also, hoping this generates a movement to bringing even more opportunities for a group of our society that is underserved. These are great first steps, much like the first taken by Universities when Title IX was first introduced. This is an awesome oppurtunity for college students and glad to be part of the movement. this is very to cool to see just as long as it stays strictly for those who are blind and visually impaired. Ho Joehlert. Thank you so much for your comment. 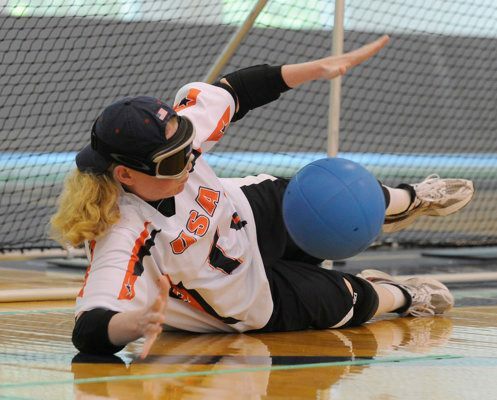 Is there an issue if people without disabilities learn to play Goalball?